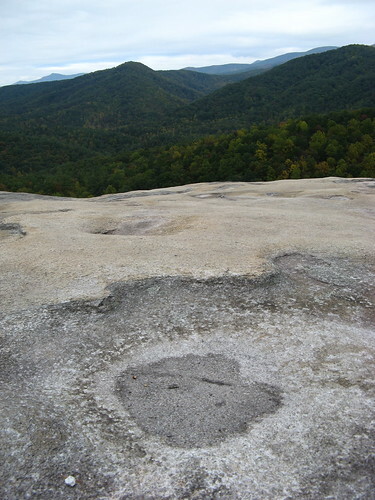 Tip o’ the hat to Smokies Hiker, who suggested a stroll along Wolf Rock Trail at Stone Mountain State Park. There are no wolves, of course, but there is plenty of rock. My eight-mile loop was a considerable improvement on the standard 4.5-mile Stone Mountain Loop hike most folks do. 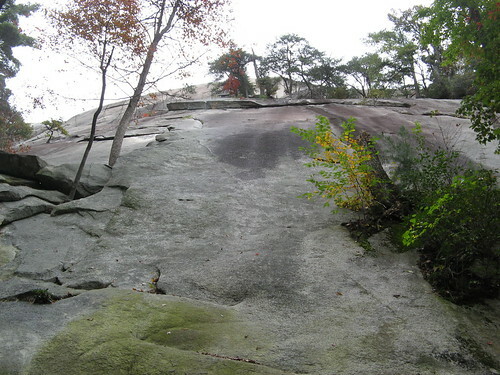 As you may recall from my first trip to Stone Mountain (once more for emphasis: this not the one in Georgia), the dominant feature of this park is an immense granite dome sloping high above treetops. A smaller granite dome across the valley door contains Wolf Rock and Cedar Rock, which have wide expanses of pock-marked stone overlooking the nearby hills. Admittedly it’s not quite as wonderful as Stone Mountain, but you have to share the signature summit with everybody else; there’s a great chance you’ll have Wolf and Cedar to yourself. A bonus on Sunday’s hike: the 1.5-mile Black Jack Ridge Trail, a leisurely stroll through a thick forest showing the first convincing evidence of autumn’s approach. I saw nary a soul on either Wolf Rock or Black Jack Ridge (mainly, I suspect, because most folks were in church praying for theirs). And yet another bonus: More waterfall action. I stopped by the Widow’s Creek Falls, just up the road from the backpackers’ parking lot, and squeezed off a few frames. 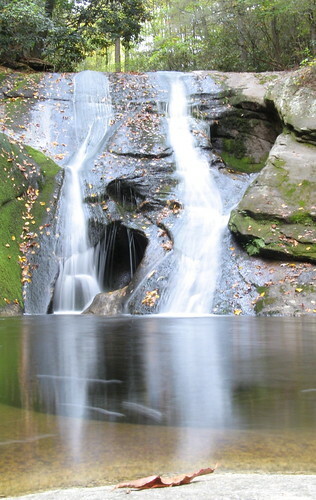 The Waterfalls of North Carolina site calls this the prettiest one at Stone Mountain. I’m inclined to concur. 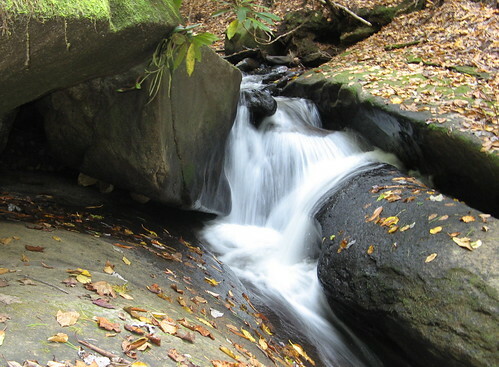 And it looks even better when there’s a strong flow in the Widow’s Creek. I went a little crazy with the time exposure on this one (2 seconds! ), but it created a nice milky blur. 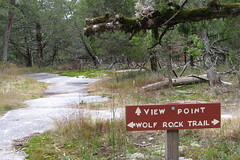 So, the hike: I started at the Lower Trailhead and followed the signs to Wolf Rock Trail, which is steep in a few places but climbs at a generally reasonable clip to the hilltop. 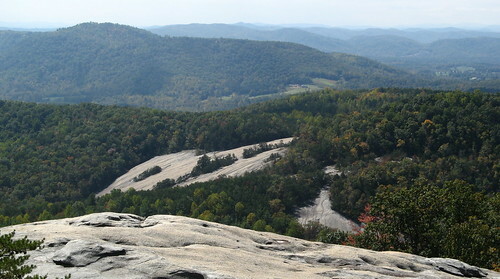 Wolf Rock faces away from Stone Mountain, offering impressive views of the Blue Ridge Mountains. Gray skies dimmed the show the a bit. Later in the day the clouds would open and expose some of the best blue I’ve seen since California (we never get those impossibly-blue skies around here; any day with low haze is a gift). 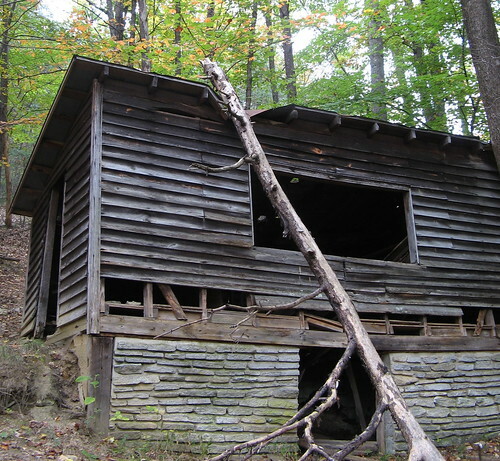 This decrepit cabin is slowly surrendering to the forest not far from Wolf Rock. 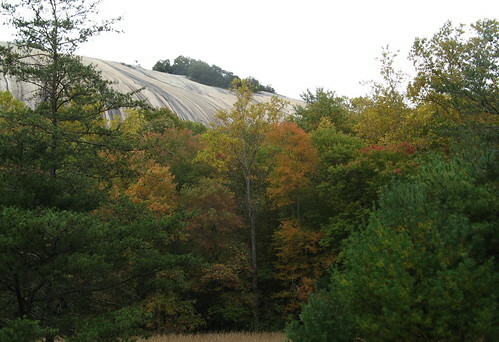 The best view of Stone Mountain is from here, on Cedar Rock. There is a trail down to the base of the mountain from here, but I chose the Black Jack Ridge Trail, which adds a half-mile to the descent, making it a bit less knee-grinding, I suspect. 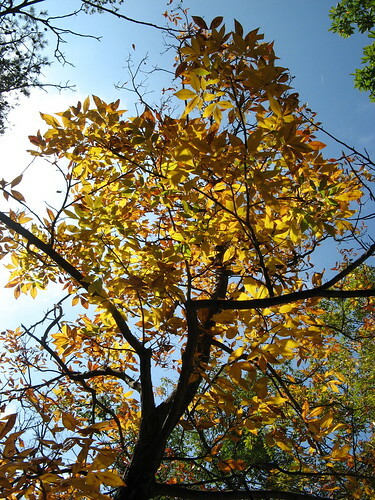 The green is slowly giving way to fall color — it’ll probably peak in a couple weeks up here. 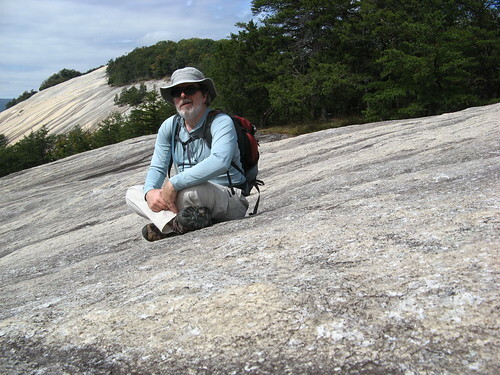 I made my way back to the valley floor between the two domes and headed up to the climbers’ area at the base of Stone Mountain. I took this as a cue to protect my noggin and hike on. The climbers’ area has a delightful pile of boulders — almost reminded me of Yosemite. Fun place to clamber about. 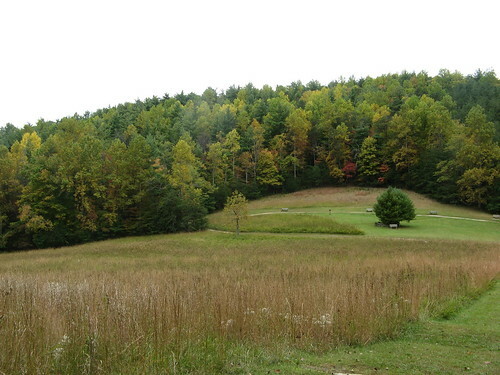 Nice view of the meadow between the two hills. I could’ve called it a day right there — it’s maybe a quarter mile back to the parking lot — but I have a hard time justifying driving 60 miles to hike four, so I tried out the Stone Mountain Loop in the opposite direction from my first outing. Couldn’t resist one more shot of the dome rising above the trees. These were all green 11 days ago. 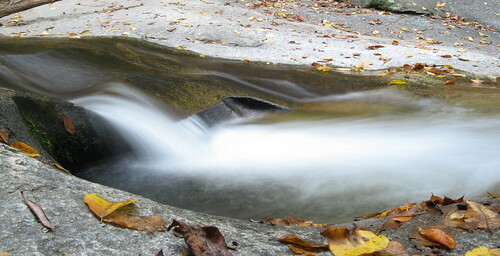 Had to grab another blur shot along the creek on the way to the Upper Falls. More color in an area that was all green on the 29th of September. So I climbed what seemed like a million steps, then made my way up the hill toward Stone Mountain summit. The sun started coming out on the way up, so I took a self-portrait that I might use as a new profile picture. Shot this at about at about 2100 feet; that leaves another 200-plus to the summit. 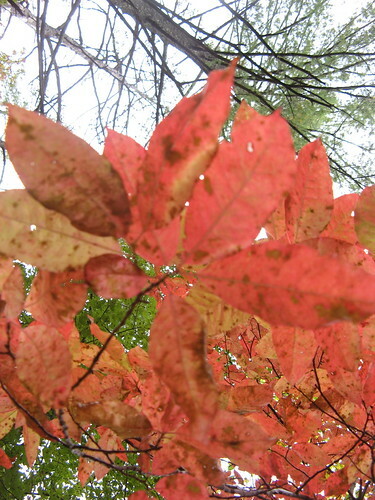 The colors were notably more vibrant above 2000 feet. 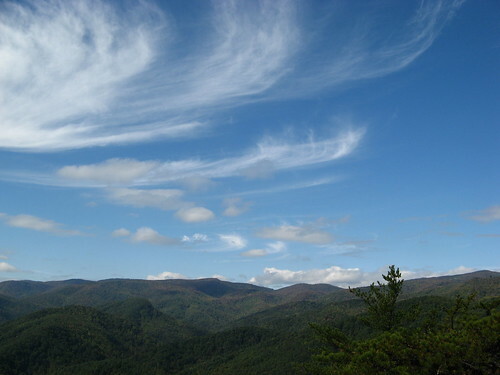 Little specks of red were visible in the far peaks, which rise above 3,000 feet. That’s Cedar Rock over in the distance, where I had been a couple hours eariler. Finally got some blue sky after lunchtime. From there it was a knee-jamming descent back to the Lower Trailhead. 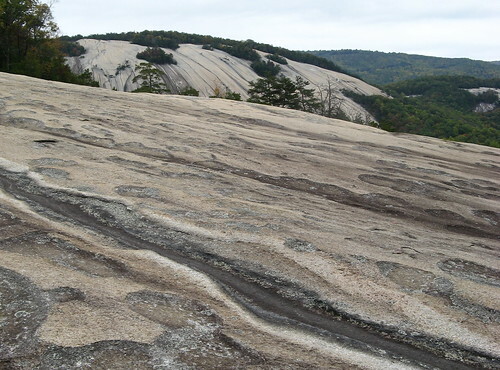 Stone Mountain is called a “strenuous” hike almost entirely because of this stretch. 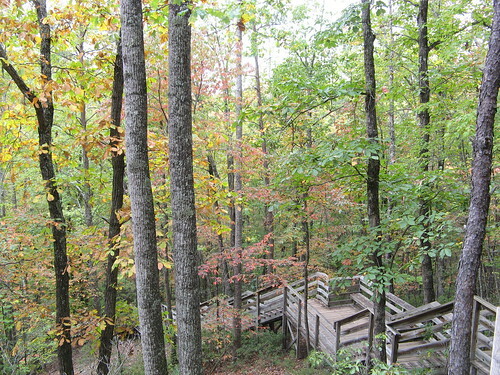 It is a meanie — going down is almost as tiring as going up — but hey, hiking is supposed to be vigorous walking, right? Have to close with this observation: this park is the equal of any of the better Bay Area parks. Similar elevation, rich forests, great vistas (especially on sunny days). If this were California there’d be a couple dozen state parks from here to Greensboro. Instead we have to make do with three, which means crowds on the weekends. But if you start out when they open the gates at 8 you can score a fair amount of quiet time before the throngs arrive. Here’s an EveryTrail trip with GPS tracks. I’m delighted that you found Stone Mountain SP, one of my favorite places and one that I’ve highlighted in my second hiking guide “Hiking North Carolina’s Blue Ridge Heritage”. But did you find the field of Moonshine equipment? Wilkes County was the moonshine capital of the world and there are plenty of remains. 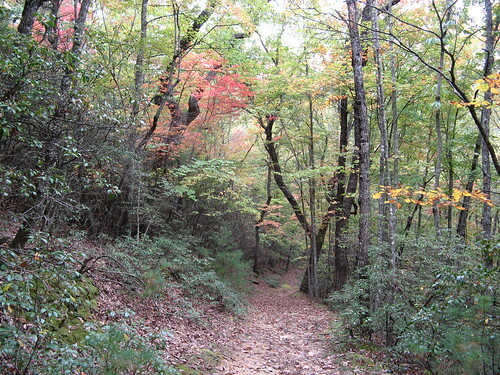 Check out my hike #8 Stone Mountain Loop and the field is only a few yards from the trail. Danny: Didn’t see the remains, but I’ll go scouting for them next time. Tom, you ain’t lacking for nothing, nature-wise! Tom, It looks like you are having a good time back there, but then looking at your pictures, I can see why!